In that view, I'll publish this page and update the section on drones while asking for some crowd source help. 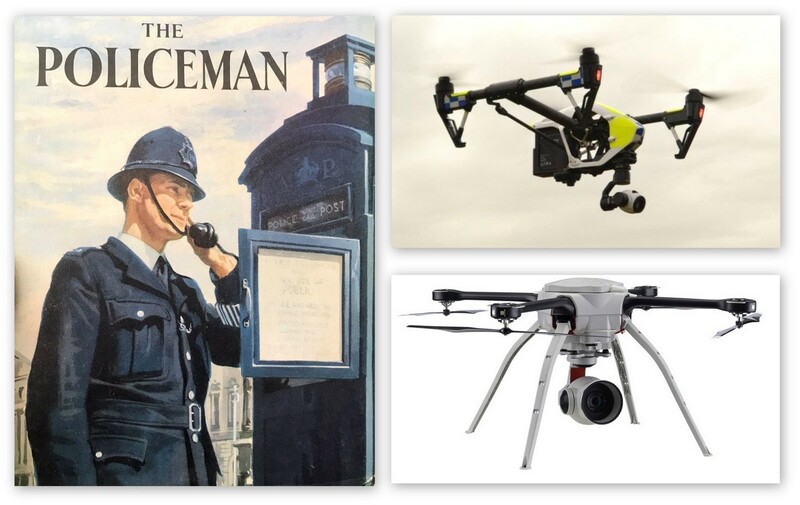 I have a new page called The UK Police and Fire Drone Resource Page (published 13 March 17). Unless of course, if you’re reading this and know someone that's extensively researched the UK Police use of Drones? I'd be delighted to hear about it - and it will save us all some time. Introduction - These ideas have surfaced from sitting in a series of public meetings. You know the sort, table at the top with a Police and Crime Commissioner sat there along with a local Police Officer and maybe a representative from the Council. The public are invited, where each person on the top table gives an outline of their role and some recent updates. What follows, questions from the floor..
And that’s where this post starts up as no matter what, some familiar themes are visited time and time again. You’ll see from the title, ‘Bobby on the Beat and The Drone’ one is the possible past where the other is a possibly future. The key idea, for me at least, in this post - getting to grips with an workable understanding of the issues. And therefore applying some education over time. Back to the recent meeting, not only was the phrase Bobby on the Beat voiced (again), but also ‘police officer in police houses’. In one way, I don’t even want to look up a date - what’s for sure that is firmly in the past. The other repeated word, maybe a phrase on it own, ‘drone’. When this word gets voiced, I’ve heard a few audible gasps, a few smirks and a lot of belittling. A conclusion, the majority of people have less than any real idea what a drone is, what it’s capable of and how cost and time effective it, they can be. If asked to name three drone brands, could they even name one? I think not. Ask them to name three brands of mobile phone and I bet they can name ten. See the difference..
One sadness, how public meetings attract a very small audience (15 - 35 people, only in exceptions over a 100 people). And of those the demographic is over the age of, well let’s just say retired. Is there a case or attraction to get the young involved? And by young I mean folk in their twenties or thirties (people who know me are aware of my many posts on live video streamed on the web under one hashtag, however less than 1% of public meetings use these method, see this post as an example WMP Handsworth Wood). Holding my hands up, I’m going to say I was teaching seven to eleven years old in schools when Google started up in 1998 and as the Internet went mainstream I was teaching the key points back to the children, and here we are nineteen years later and I class myself pretty tech savvy for my age. I find this mobile, web stuff like sliding down a waterslide - fun, easy and incredible fast and useful. The real win, how it’s in my nature to share. I can teach it, write about and help people come to terms with it all. That means coping with the modern world around them. Bobby on the Beat - I guess this all about fact and fiction. On one hand, we have the Police Officer walking down a street in Custodian Helmet, maybe sporting a moustache, and every Tuesday at 3pm stops at a local shop in the market square for a cup of tea and a biscuit. This is what I experienced in 1984. As a subset visual, some things are quite odd yet seem to work. 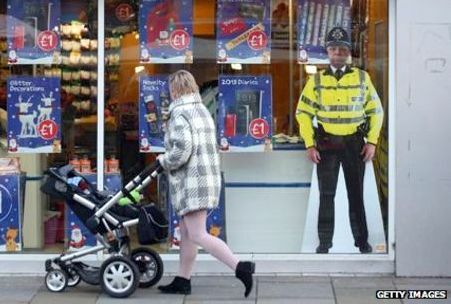 Take this outline of an officer attached to a glass window in a shop. It’s lifesize, colourful and apparently serves as a deterrent to crime. The human brain plays tricks on us. We consciously know the officer is not real, yet are engulfed in the idea we are being watched. I wonder who thought up the idea? On the other hand, the mobile officer in 2017 with a handheld smart device like a Samsung Note 4 allowing no real need to be visiting a legacy police station. They work from a patrol car as their office, in the community and freeing up a many hours each day by using that tablet phone thing that’s constantly connected to the internet, loads all the software and processing systems that an old school desktop computer can do. Of course that same officer is probably on twitter, probably has taken part in some public photo that’s been shared on facebook, instagram and snapchat. And is probably used as an early warning system for local reporters on breaking news. The internet is a beautiful thing - it saves us an inordinate amount of time used effectively. It’s passage of fast information blesses and curses us in equal measure. And along with that, a vast number of myths and fallacies. A simple rule, I guess just like the sports team you support - if it works and wins, it makes you happy and life is wonderful. Not working or problematic - then life is terrible, you feel desperate and alone. As an example, ever tried buying a new laptop, phone or smart TV - you can be thrown into a spiral of mind numbing stress and confusion. And when you do finally make a choice and take the box home, on opening not one piece of real paper in there to serve as a quick start guide. OMG I need help. Some Air and Tech History - And by time, I mean the past compared to the future. For it's quite easy to look over the past 50 years. Did you know the police radio was first used by the British Police in 1969. And the UK Police Drone notable dates as around 2007, 2010 and 2014 (2011 in the USA, 2013). 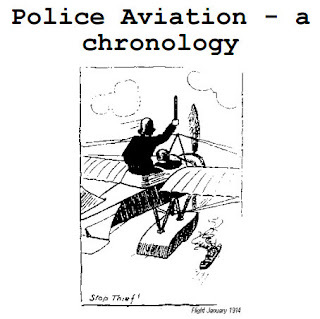 As for Police Forces using aviation - a fixed wing in 1919, an airship in 1921, autogyro 1936 - with the LAPD from 1956. According to helis.com, the helicopter history site, the first UK Police Force created the first fixed wing unit in 1974 (North Wales and North Yorkshire). The Metropolitan Police Air Support Unit was formed in 1980. 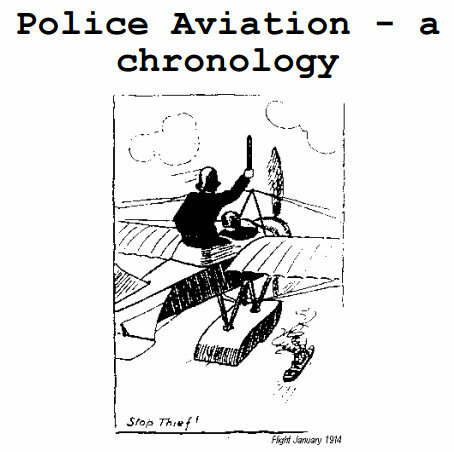 This is a lovely read, 'Police Aviation - a chronology' from 1914 to 1998. In many ways, here we are 100 years later with the same flying technology, albeit much much smaller. However in drone tech (and mobile phone tech too), 6 months is a long time, meaning devices get smaller, faster and lighter. In other words, police drones in 2017 could be vastly different to police drone in 2020. The Power is in the Downlink - And this means sending realtime video feeds to officers on the ground (on what's seen from the cameras in the air). Think of it as the classic News Helicopter Live TV feed. One of the first ever being broadcast was Feb 1988 where a bank robber was chased by police. Exactly one year later Sky News launched in Europe. 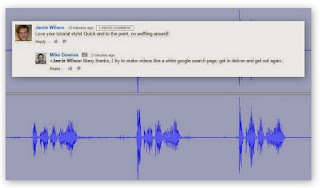 Police Helicopter image downlinks have been available since 2004. However, the big recent development, the ability to receive realtime NPAS Helicopter images directly to an officer's mobile smart device, like a Samsung Note 4 (more on that in my other post, 3 Nov 16). I'd imagine this is a four step process: 1, helicopter sends live video feed 2, base station receives video feed 3, video feed then sends to the internet, where 4, police officer open a smart device like a Samsung Note 4 and watches -- all in realtime by the way. Amazing really. Drone Technology - A Drone will fly, it will then record video. It will then stream that video to a mobile phone or tablet on the ground. This is sometimes the pilot, sometimes another operator. Depending on the setup, these images could be streamed live over the internet, maybe reaching a service like YouTube, Facebook or Twitter/Periscope. Think of this as a mini helicopter downlink, because that's exactly what it is. But remember, back in the late 1980s, early 1990s it took quite large industrial sized boxes and a real size helicopter with human being sat inside, where a drone can be the size of a dustbin lid. This document from SVP gives a brochure and a few images. For more images and a case study on Live Sports Transmissions, think Cycling, Motorbikes and lots of white Truck full of gear. Aeryon demonstrate live video beautifully in this video. I believe most drones will record HD video to a hard drive on the drone, and send a lower resolution of video to a base station. This makes perfect sense as any live streamer will know sending HD video live has lots of buffer bandwidth issues. For a look at the DJI Inspire 1 Drone which Devon and Cornwall Police are using, watch this video (or watch from the playlist below). And as a last idea, think about all the TV you watch - how else do you think the show producers captured all those aerial shots? Examples range from BBC Planet Earth, watch for ten seconds to see an image of quite a large drone. Another example, m60.tv that worked with Ray Mears Wild River, Robson Green and others. Last up, brilliant short read from LA Times on how 'Drones are providing film and TV viewers a new perspective on the action' and at the fraction of the cost of a helicopter. Modern Police and the Drone - Going back to a Police Officer walking a beat for a moment, and I’m pleased to say I saw one today, what happens if they receive a message? Let’s look at a case study where a missing person, maybe a vulnerable adult (or child) could be located somewhere in an area of ten square miles (as a best guess based on available intelligence). What do we do? Police officers received a radio message, they maybe on foot, a bike or in a car. Let’s say the Police Helicopter is unavailable. The obvious solution, flood the area with eyes and ears, maybe ask for help from the local community. For a real life example in chilling temperatures in the dark, have a read of Sgt Harry Tangye’s tweets (and this twitter moment, 30 Dec 16). He was out in Devon, Cornwall somewhere using his night sights to locate a teenager. He found her laying on the ground shivering. It’s high pressure stuff. Enter the Drone - One officer getting the call will drive to a spot, unbox the drone and fly. This is a fast and effective way to search a large area in very little time and in a fraction of the cost of a police helicopter. Police - On a google search for UK Police Drone, we have a few excellent pages. I’ve a list of two uk police drone twitter accounts to follow, sure there must be more. ~ Essex Police - on twitter as @epolicedrone (1,396 followers as 12 Mar 17). ~ Surrey Police have an excellent webpage divided into seven readable sections detailing the Aeryon Skyranger quadcopter model which can carry daylight/thermal and HD Cameras. Drones can be used for missing persons search, assistance in RTC, major crime, industrial accident, event planning and situational awareness. On 8 April 2016, details were published on how Sussex/Surrey Police have acquired four new Aeryon Skyrangers (making five in total). At this point, I will link to the Aeryon Spyranger features webpage -- all information is general to Aeryon, NOT Surrey Police (as I have no idea what model they are using). Fire - to be added, see resource page created 21 March 17. Conclusion - to be written, as you can see section above is still searching for information. So like any good immersive page, it will get updated..